Who will replace Microsoft chief executive Steve Ballmer? 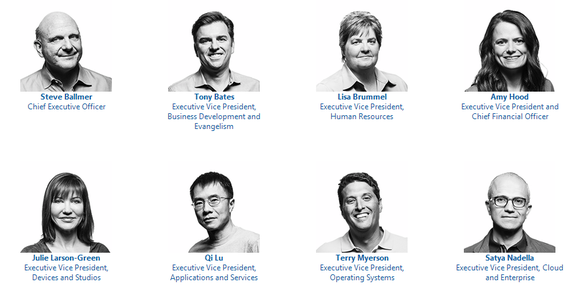 Microsoft’s executive committee has up to a year to decide and a pantheon of candidates from which to choose. In many ways, identifying the next chief executive of Microsoft is a commentary on Microsoft’s current track record. Does Microsoft’s executive committee and board continue down the path that Ballmer began? Has the company failed to execute in some way? Or is a new direction required, perhaps with an emphasis on a particular business segment? All of these questions could guide Microsoft’s CEO search. Ballmer’s announcement that he will step down in twelve months came as a welcome surprise to Wall Street, which promptly sent Microsoft’s share price up about 6 percent. Microsoft has struggled to convince the market that its vision for Windows has been the right one, and the planned Windows 8.1 update is seen as a do-over of sorts. Ballmer shook up its leadership team this summer,re-aligning the company with his vision of Microsoft as a devices and services provider. The problem? The “flat” structure of the reorganization left no obvious successor. While Microsoft has not been averse to hiring from outside the company—chief operating officer Kevin Turner most recently served as chief executive of Wal-Mart division Sam’s Club—some of the company’s most senior staff have been long-time Microsoft employees. The executive committee that will find a replacement for Ballmer includes John Thompson, the board’s lead independent director, plus chairman Bill Gates, chairman of the audit committee Chuck Noski and chairman of the compensation committee Steve Luczo. Julie Larson-Green: On the surface, Larson-Green would probably have the inside track. As executive vice president in charge of devices and studios, Larson-Green oversees the company’s hardware businesses, including the Xbox and Surface; she also directs the content studios that run on them. She most recently led the product planning, design and delivery of Windows 7, Windows 8, and Windows 8.1, as well as the rapid release cadence that now characterizes the Windows environment. In addition, she’s a 20-year Microsoft veteran. Gates is on record that Windows 8 is a “huge advance for Windows,” an important vote of confidence. But would Larson-Green do with a bit more seasoning before being named for the top spot? She hasn’t had that much time in her new role, having just assumed it as part of the recent reorganization. Qi Lu: As the executive vice president of Microsoft’s Applications and Services Group, Lu is responsible for tying together Office, Bing, SharePoint, and a number of other services within Microsoft. As such, he’s the “services guy” that Microsoft could elevate to the top role. However, Lu was also promoted away from the Online Services Division, which seems to perpetually lose money. Terry Myerson: Myerson’s job is to lead Microsoft’s OS vision as executive vice president of the Operating Systems Group. Myserson’s task has been to design in commonality within the Windows, Windows Phone, and Xbox operating systems. Although we’ve seen some elements of that—Internet Explorer in the Xbox One, some Xbox services in Windows Phone—it would seem that there’s still more work to do here. Promoting Myerson out of his current role would require an equally competent replacement. Stephen Elop: As former Microsoft evangelist Don Dodge notes, one possibility from outside the company to lead Microsoft would be Elop, now chief executive at Nokia. Elop formerly led Microsoft’s business division, the home of the seemingly perpetually profitable Microsoft. But Elop also jumped ship to join Nokia, after what some described as dissatisfaction with Microsoft. On the other hand, although Elop has forged a strong partnership with Microsoft in his current role, Nokia has still struggled. Elop could indeed come back to the fold, but Nokia’s recent performance may color his chances. Steve Sinofsky: Sinofsky, who was recently named a partner at Andreessen Horowitz, abruptly exited Microsoft after the Windows 8 launch and has not spoken publicly of his departure—or of Microsoft, apparently bound by a non-disclosure clause in his contract. Although Larson-Green is credited with the rollout of Windows 8, Sinofsky designed it—and again, how the board sees the OS may affect whether or not Sinofsky is invited back. Does Sinofsky see himself as a Silicon Valley power player, or as a leader of one of the titans of the technology world? Other possibilities: Jeff Raikes, who currently serves as chief executive of the Bill and Melinda Gates Foundation, would have to be willing to give up his post—and Gates would also have to be willing to let him go. But there’s no question that Gates could vet him for the role. And then there’s the wild card angle: the committee could hunt down a fresh face from outside the company. That’s actually a viable possibility when you consider the fact that Microsoft is shifting away from what it has been—an OS company, centered on the PC—to a more nimble services company straddling a multitude of devices. Could someone like Dale Lee, recently promoted out of a role as president of Samsung Telecommunications America to a special advisor post, be an option? Lee drove Samsung’s phones and tablets to the top spot in the U.S. market. Forget Bill Gates, though—even though some hope he’ll return. The only one who can turn around Microsoft's disastrous situation is @BillGates---he is a true visionary and leader. What seems clear is that Microsoft won’t wait the full 12 months to name a replacement. Every quarter that goes by without such a name raises questions; establishing a successor early allows an informal or formal transition team to take place. But the Ballmer era will come to a close as Microsoft tries to remain relevant in a post-PC world. And that’s Job One for the new recruit. Updated at 12:04 PM with comment from Patrick Moorhead.